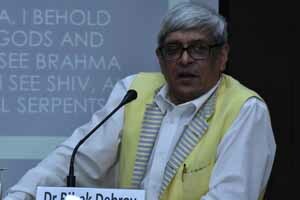 Dr. Bibek Deb Roy, eminent scholar and Chairman, Economic Advisory Council to the Prime Minister, gave a talk on the Bhagavad Gita. He announced at the outset that he would not deal with the ‘big things’ about the Gita—dharma, karma, tyaga, bhakti and so on, but with small things that often escape our notice. In the introductory part of the lecture, he mentioned that there are at least 30 different Gita’s in the corpus of Hindu scriptures. He also shed light on the category of ancient Indian texts called Itihasa. The word literally means “this is indeed what happened”; hence, Itihasa refers to history, not myth, although this history might have some embellishments. Mahabharata was always treated by the ancients as an Itihasa text. Later on, Ramayana was also added to the category. Then, there were the Puranas, of which there are 18 Maha Puranas. Dr. Deb Roy highlighted the relationship between the Vedanta tradition on the one hand, and the Itihasa-Purana tradition on the other—these were parallel streams that converged. It was realised by the sages of yore that Vedanta was not digestible for the ordinary person; hence, the Puranas were composed to convey Vedantic truths in the form of stories. Next, Dr. Deb Roy went on to closely examine the use of particular words in some of the verses of the Bhagavad Gita (like 1.2, 1.3, 1.26-27, 2.1, 3.37 and so on). In the course of discussion of these minutiae, many subtle aspects of the Gita came to the fore. The purpose of the speaker was evidently to engage the audience with the text more up close and personal, to awaken an interest in the text beyond the ‘big things’. For instance, a trivial indication in one of the verses that indicated Duryodhana’s position at the beginning of the war, that further indicated how war rules were adhered to at least till the Dronaparvan. When the war was not on, both sides were friends and relatives. Dr. Deb Roy mentioned in the passing that King Ashoka’s remorse was after all not for having killed so many in the Kalinga war, killing among soldiers was normal in war; what Ashoka was aggrieved about was the large-scale killing of civilians in the course of his war. He also spoke about the meter in which the Bhagavad Gita was composed. Since the Gita is a pre-classical text, the poet could take considerable liberties in changing the meter in the body of the same text. For instance, while other chapters of the Gita had a deviation rate of 5-10 percent regarding the meter, Chapter 11 had a deviation rate of 60 percent. Such minute details about the text from an eminent translator of the text was enlightening. Dr. Deb Roy also answered many questions from the audience. In response to one such question, he pointed out that the Mahabharata was composed over a period of 1700 years and definitely social norms must have changed over such a long period. Hence, according to him, it is a sterile debate to try to rationalise internal inconsistencies and settle chronologies as far as such ancient texts are concerned — that is the domain of the scholar who labours himself/herself over the nitty-gritties of the text. Not resolving these debates by no means diminishes the value of the text. As an Indian, our first object should be to engage with the Gita closely for what it speaks for, the speaker averred.